Each year, students in our World History, French III, and Holocaust classes submit entries to the Jewish Federation’s Holocaust Creative Arts Competition. Many schools from the Lowcountry enter. Congratulations to this year’s winners from BE! 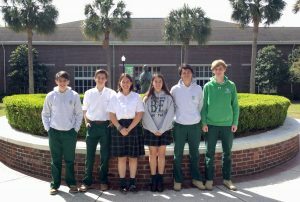 For Creative Writing…First place: Jillian McManus, second place: Chase Bruder, third place: Emma Albano, and honorable mention: Michael Stebbins. For Visual Arts…First place: Margaret Woody, third place: Nicole Boyd, and honorable mentions: Rosie Hanna, Grace Hotchkiss, and Aidan McCool. Thank you to all students who entered. All work submitted will be on display at the Charleston County Library downtown and the awards ceremony will take place there on Sunday, April 28 at 3pm.